Sunday is the day my girls return from their dad’s, and it’s always so shiny and happy to see each other. Before we can do anything, there must be the competitive airing of The Insults and Injuries That Have Occurred Since Our Last Meeting. If it’s a scratch, however faint, I must examine it, and if it’s a bug bite, I must feel the bump. I’m a focused mama monkey after finding a tick attached to the back of Violet’s ear during an intake inspection a few months back. Inevitably, it’s during the owie updates that the sisters erupt into their first shouting match, cutting each other off with soap opery accusations, “Mom, SHE’S just trying to get you to LOVE HER MORE!” or “SHE’S LYING ABOUT EVERYTHING! Can’t you see the LOOK on her FACE? IT WAS ALL HER FAULT!" I was totally done by 11 last night when I was demanding they put their little heads on their pillows and read their books quietly if they weren’t sleepy. I haven’t been able to completely transition them away from Hawaii time, which means we can sleep in like champs, but those kids were tired wrecks last night - howling and yelling from the loft bed; sobbing and screaming from the doorway. I stood in between with my hands up, like I was under arrest, repeating: You. must. chill. Calm your body. Breathe! GO TO BED!!! Our day had been nice. There was emo, but we handled it. Sure, we didn’t play Monopoly Junior for the Family Olympics as promised, but we played that game recently. And, Violet and I went on a couple walks. Daisy helped me clean our apartment for hours. The kids played with the neighbors. We watched the shows the kids are obsessed with on Disney TV. In the afternoon, with Starbucks in hand, we took a leisurely stroll through the brand new local Target, the first to open in our own town (vote yes for equal access to big box retail). For dinner we walked to sushi. What was so terribly wrong? There are changes going on with Daisy that have nothing to do with divorce or the annoyance of sharing a small space with her mother and sister. I proved that recently when she was spinning out erratically and *LIGHTBULB* . . . wait, I know what to do! Little Violet and I formed a relay team gathering supplies. Five minutes later, Daisy was in a warm, soothing oatmeal bath in candlelight, gripping ice cold lemonade in one hand and a small piece of dark chocolate in the other. No joke. 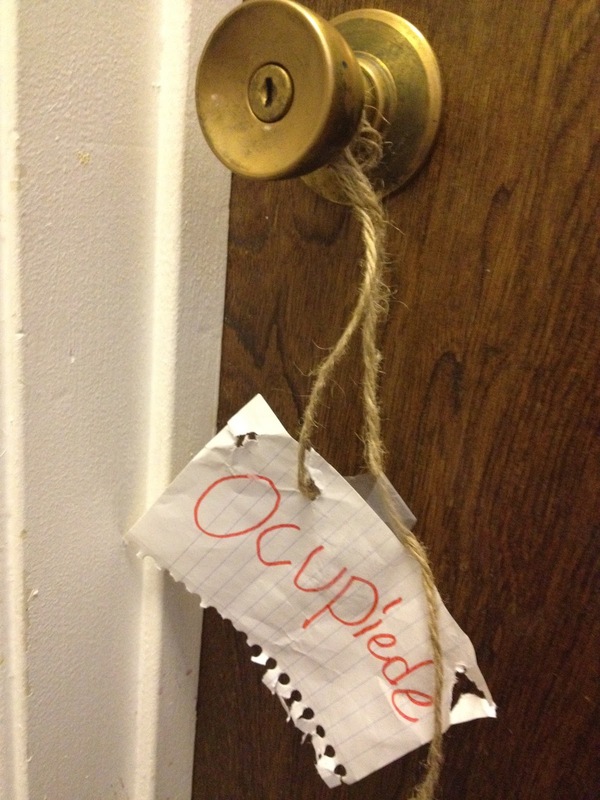 Violet and I pulled the bathroom door closed behind us in relief, and Violet hung a sign on the doorknob. We had subdued a Tasmanian devil. Post bath, Daisy was ALL BETTER. Hello, hormones. At almost nine, she’s so young. However, puberty starts for many girls around 8 now, while boys are still clueless for at least another couple years. I still haven’t fully wrapped my mind around what this means for our girls, but it appears that this household is at the beginning of a very long and cranky process. Especially with a reactive volcano of a little sister. If Violet spots Daisy in her training bra, she instantly explodes, punching her in the arm, “I don feel COMFOBLE to see you in a BWA! I HATE YOU SIS!! !” If I’m not on the scene fast enough, there’s often a slammed door or perhaps a ripped up drawing Violet used to clarify her position on the training bra vs. no training bra debate for her big sister Daisy. I am hoping every day to get the news that the bank will approve the short sell my parents are doing their best to make happen. The girls and I could clearly use a little more air. We’re already planning the dream timeout space in our hoped-for attached garage, complete with punching bag, refreshments, music, a suitcase to grab for empty threats, a comfortable place to sit or lie in a ball, reading materials, decent lighting, mirrors, and makeup. Applying makeup is one of the ways my girls like to calm themselves. I’m OK if they do that once in a while at home during the day, but I was pissed when Daisy walked out of the bathroom last night with makeup on after taking a bath - while her sister was waiting in the hallway to take a bath.